Very close to everything, good for groups. Very competitive price. 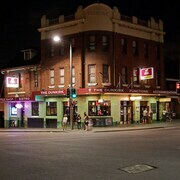 5 nights in Sydney Great location, comfortable, close to the casino and darling harbour. 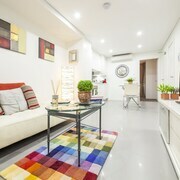 Clean large apartment with everything you need. Been struck down with FOMO? 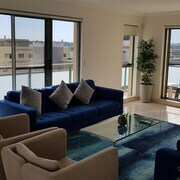 Spoil yourself with a break in Pyrmont. 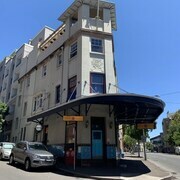 Located 1 kilometre from the centre of Sydney, it's a brilliant place to stay while exploring New South Wales' capital. If you have a thing for crossing off bucket-list attractions, Sydney doesn’t disappoint. An outing to Bondi Beach, Sydney Opera House and Sydney Harbour Bridge will give you major travel bragging rights. Too worn out to travel miles away? 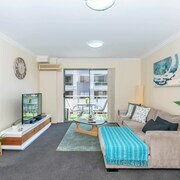 Trying to find a room near Sydney Opera House? Simple. Suss out the Park Hyatt Sydney, Pullman Quay Grand Sydney Harbour, The Darling at the Star, Quay West Suites Sydney and Establishment Hotel. Separate yourself from the hustle and bustle by relaxing in Fitzroy Gardens. You'll find a few places to crash close by. 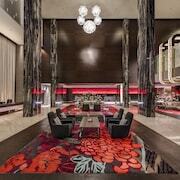 The Langham, Sydney and Fraser Suites Sydney are among the most popular spots to rest your tired noggin. Plan to stop by Mrs. Macquarie's Chair, an eye-catching rock formation and a stunning natural creation. 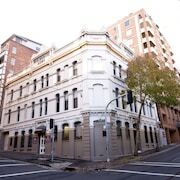 You'll also find great hotels within close reach of this attraction, such as the Sydney Harbour Marriott Hotel at Circular Quay and Adina Apartment Hotel Sydney Surry Hills. 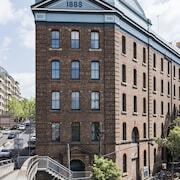 Want someplace to stay in Pyrmont but don't want to burn a hole in your wallet? Check out the disgustingly good rates at the Woolbrokers at Darling Harbour. You'll want to snag a room quickly though, as there are limited budget hotels here. You certainly don't need fluffy bathrobes, a delicious room service menu and luxurious cotton sheets all the time (that said, it can be nice sometimes, right?). 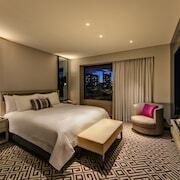 The more elegant options here are the Astral Tower and Residences at The Star and Ovolo 1888 Darling Harbour. Holidays! They're all about ditching the tinned food and cordial and spoiling yourself. Why not start with a caffeine fix and a scrummy snack nearby at Stockroom Cafe? Odds are you'll all be totes starving by the time dinner comes around, so why not book a table at Blue Eye Dragon? Whatever you feel like eating, the chefs will take good care of you here. You could stop there, but why on earth would you? You're on holiday, right? Either way, there's a pint with your name all over it at The Bar at Sokyo! How about booking accommodations in Darling Harbour or Glebe when planning your adventure? Darling Harbour is 0.4 kilometres from Pyrmont, and Glebe is around 1 kilometre away. So, have a quick glance at the Pyrmont forecast, pack your best outfits and get a move on! You're only a few clicks away from amazing nights and jaw-dropping experiences!